Thursday, September 19, 2013 Posted by Sarah M.
If you use a wood burning fireplace to heat your home, you want it to be as efficient as it can be. Fireplace firebacks are constructed of cast iron or stainless steel materials and are placed on the back wall of the fireplace to radiate heat from the fire into the room. When choosing a size of fireback, you will need to consider both the size of your firebox and the size of the fires that will burn in your fireplace. You want the fireback to be large enough to shield the back wall of the fireplace from the raging flames. If the back wall of your fireplace is perpendicular to the hearth floor, you can simply rest the fireback against the back wall. For those fireboxes with slanted firewalls, the use of fireback feet or boots are required for safe installation. These accessories secure the fireback, so it will not tip over. Depending on your fireplace setup, you also may need to raise the fireback off the floor to ensure that it's elevated enough to radiate heat into the room. An easy fix is to simply place a few bricks underneath the fireback to raise it up to the appropriate level. It is also important to make sure that the firebox is centered within the firebox for best results. Firebacks are not only functional, but they can add a decorative flare to your hearth and complement the overall design of your home. You can find a wide range of designs that span from plain and conservative to edgy and ornate. 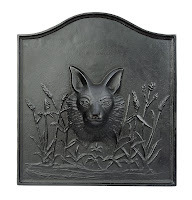 Purchasing and installing a fireback is an easy way to open your hearth to more creativity and make it unique from all the others. Like what you're hearing? 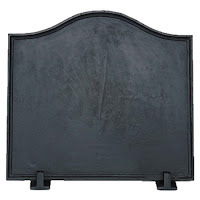 Woodland Direct offers the largest selection of fireplace hearth products online. Contact one of our technical sales representatives today for additional service. Pretty fine article. I just stumbled upon your web site and I'd like to say that I have actually enjoyed reading your blog posts. I'll be subscribing to your feed anyway and I hope you'll post again soon. Big thanks for the valuable info.